It sounds extremely complicated but it isn’t. Four Colorado brewing aficionados of the sometimes hazy, always fruit-forward or tropical style of IPA that was popularized in New England are bracing themselves for a craft beer collab of epic awesomeness. Robot Librarian is the output of the brain activity of Lafayette’s Odd13 Brewing Company owner Ryan Scott, along with brewers Brandon Boldt and Eric Larkin, who beckoned the input of other CO breweries who are also embracing the style with much success. WeldWerks Brewing (Greeley), Fiction Beer Company (Denver) and Cerebral Brewing (Denver) accepted the invitation to collaborate on the first-ever NE IPA Collab of its kind brewed in Colorado. The culmination of the group’s efforts will make its way to the Odd13 Brewing taproom in Old Town Lafayette on June 16 for a rare taproom event…to be held for ONE NIGHT ONLY. Drafts will not only pour tasty hazy beers including Robot Librarian, but will also be flowing with juicy offerings from the additional 3 breweries involved, so you’ll be able to fill an entire flight of fruit bursting IPAs, and will be able to compare notes of 4 breweries at one time in one convenient place. And for that, we thank you! So what is Robot Librarian? What is NE IPA? It all goes back to hops. From tropical mango and passion fruit to lemon verbena, brewers aren’t getting their juicy characteristics from adding fruit to the mash; it’s all hops. (That is why we have so many fruit and tropical IPAs on the market these days). 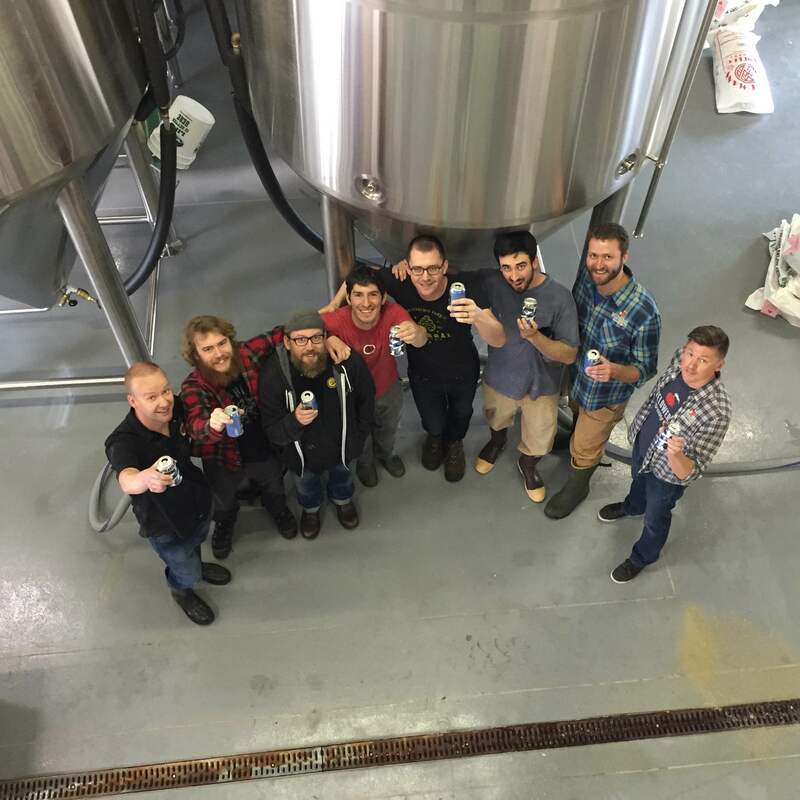 And Odd13 was the first to bring their version of the sub-style to market, having packaged and sold cans of Codename Superfan 1.0 as early as October of 2015. And fans continued to line up for releases of the beer in each of its iterations. “I think a lot of people are converging upon the same idea” Odd13 Brewing’s Brandon Boldt said about the rising popularity of the beer, whether due to the steady flow of transplants from the East Coast, or as owner Ryan Scott mentioned, through online trading and beer communities who hold lively discussions on the topic daily. “Even though we were the first (in Colorado), I wouldn’t say that other people are doing it because of us. 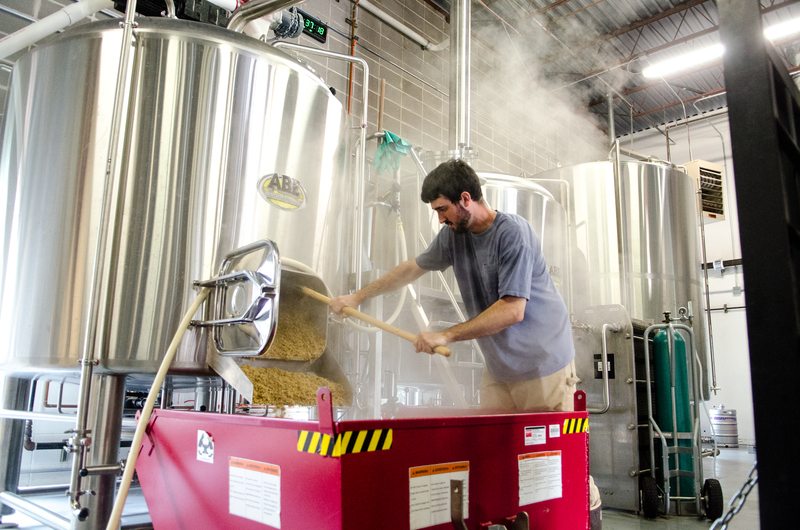 We just might have been the quickest to get it into the fermentor,” Boldt added. Brewers from Odd13 Brewing, Cerebral Brewing, WeldWerks Brewing and Fiction Beer Company collaborated on a Double IPA in the vein of New England style American IPA called Robot Librarian, which will be available at Odd13 Brewing’s taproom on June 16 and following with disribution. *Limited quantities available. Owner Ryan Scott explained the idea for Codename Superfan arose not out of creativity, but more out of necessity. 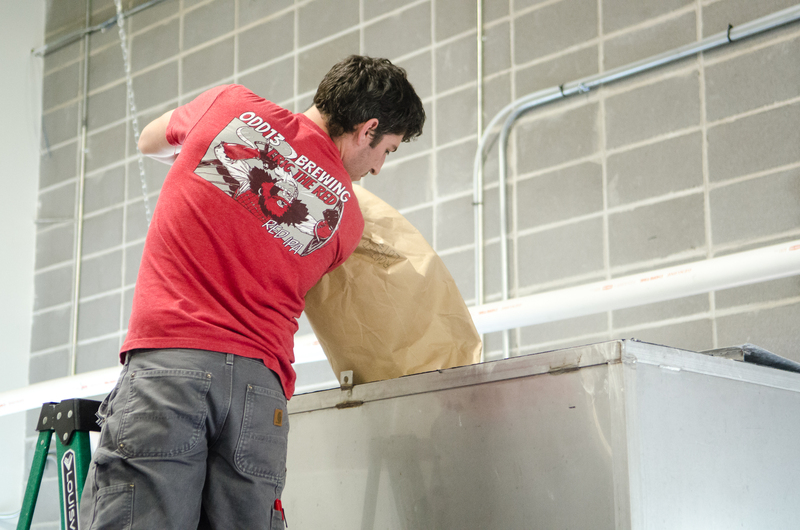 Odd13 head brewer Eric Larkin empties the mash for Robot Librarian. “It’s not one thing that we do to just make the beer; it’s like this combination of effects (we use) to get a certain flavor profile that we like,” explains Cerebral Brewing’s Chris Washenberger about the origin of the haze. “At this point in the game, we don’t know exactly what’s causing (the haze); it’s not a pinpoint-able thing due to the research we’re doing.” Cerebral has been brewing their hazy Rare Trait beer since opening doors six months ago, but add the concept of fruit-forward flavorful IPAs has been around for a decade. Odd13 Brewing’s brewer Brandon Boldt assures Robot Librarian will take on the brewery’s signature characteristic of aggressive late hop additions, but will not result in a bitter hop bomb American IPAs typically provide. Brewing techniques used in Robot Librarian include precise hop selection, as well as selective yeast additions which will “blast fruit flavor and fruit aroma into the beer,” Washenberger explained. “That’s what we’re doing. We’re not making a hazy beer – we’re making a big, crazy fruit-forward IPA, Pale Ale, whatever – but utilizing these varied chemical techniques in relation to hops, yeast and water. Odd13 Brewing Collab: Robot Librarian (generic can description) is a Double IPA brewed with Cerebral Brewing, Fiction Beer Co and WeldWerks Brewing. A soft mouthfeel complements ambitious hopping with Citra, Mosaic and El Dorado Hops. Haze is expected. Robot Librarian will be canned and available for sale at the Odd13 taproom (100 cases) and through its distribution network (less than 400 cases), which will hit shelves a week after the release party. Don’t miss this one – it will parallel the equivalent of gold in the craft beer trading community! Hi Justin, Thanks for your comment! I only know what I read from The Alchemist’s website, which states: “The Alchemist is a small, family run brewery specializing in fresh, unfiltered IPA. We are currently focused on brewing one beer perfectly – Heady Topper, an American Double IPA.” So if this doesn’t mean this is the only beer they brew…perhaps they should reword this. Cheers! The Alchemist makes more than just Heady Topper. Focal Banger, Lucious, Beezlebub, the Crusher and Petite Mutant are also the Alchemist! After further research, it appears they still do make Focal Banger, but none of the others have been Untappd since 2014. But, thanks for the info!